TriState Chimney Service is one of the most experienced chimney cleaning companies serving Massachusetts and Connecticut. Our certified chimney sweeping technicians are prompt, friendly and pay meticulous attention to details when performing chimney cleaning, chimney repairs, chimney rebuilding, masonry repairs, pellet stove installations or pellet stove repairs as well as wood stove installation and repairs. All or TriState Chimney Service's craftsmanship is guaranteed and we are licensed, bonded and insured. Our Massachusetts customers live in Worcester, Massachusetts: Sturbridge, Southbridge, Webster, Dudley, Oxford, Auburn, Douglas, Uxbridge, Sutton, Grafton, Millbury, Northbridge, Upton, Hopkinton, Marlboro, Southboro, Northboro, Westboro, Shrewsbury and more. We also perform chimney cleaning, sweeping and repairs in Spencer, Massachusetts: Leicester, Rutland, Princeton, Paxton, Holden, Sterling, Leominster, Fitchburg, Boylston, Clinton, West Boylston, Hudson, Brookfield, Berlin, Bolton, Stow, Hardwick, Barre, Hubbardston, Milford and many other cities and towns in Massachusetts (MA). Our Connecticut customers reside in Enfield, Connecticut: Union, Woodstock, Thompson, Putnam, Pomfret, Eastford, Ashford, Willington, Tolland, Stafford, East Windsor, South Windsor CT, Manchester, Bolton, Coventry, Andover, Mansfield, Windham, Chaplin, Hampton, Brooklyn, Killingly, Plainfield and many other cities and towns in Connecticut. Content Copyright 2010. TriState Chimney Service. All Rights Reserved. We are CSIA certified by the Chimney Safety Institute of America. CSIA is a non-profit educational organization existing to provide chimney and venting safety resources to Chimney Service Professionals. Although not required, we choose to be Certified by the Chimney Safety Institute of America (CSIA #6654) and are tested every three years to be counted among the elite of chimney professionals in knowledge and industry standards. Is your Chimney Service CERTIFIED? 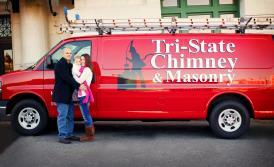 At TriState Chimney Service we strive to provide best in class sales and customer service. As a result, most of our customers will refer their friends and family members to us for all of their chimney needs. Thank you to all of our valued customers.